North Carolina’s vehicle Tag and Tax Together program was designed to collect vehicle property taxes along with registration renewals and to conveniently pay them together. If the address on your vehicle registration is current, you will receive a renewal notice that lists both vehicle registration fees and taxes due. Vehicle owners will receive this renewal notice about 60 days prior to their vehicle’s registration expiration. Beginning in 2013, your annual vehicle inspection, registration renewal and vehicle property tax will be due the same month each year. Only one payment – made either in person, online or by mail – is required to pay both the annual tag and tax for your vehicle (Inspection fees are still paid to the inspection station). The new annual renewal notice combines the information about your vehicle registration renewal fee and the vehicle property tax due. The renewal notice includes separate contact information for registration questions and for tax questions. The new Tag and Tax Together program allows you to make one convenient payment to NCDMV for both registration renewal and vehicle property tax. NCDMV will forward the property tax portion of your payment directly to your county revenue department. The North Carolina General Assembly passed House Bill 1779, creating what we call the Tag and Tax Together program – a more streamlined method for vehicle owners to pay their registration and vehicle taxes. Beginning in 2013, annual registration fees and vehicle property taxes will be paid to the Division of Motor Vehicles. The DMV will, in turn, distribute the taxes to the appropriate counties. What changes with the passage of this legislation? Currently, vehicle registration fees and vehicle property taxes are billed and paid separately. Each county is responsible for managing vehicle tax collections, while DMV handles registration fees. Beginning in mid-2013, DMV will begin sending out registration renewal notices that invoice the vehicle tax due along with the registration fee. The fees are listed separately, but will be due at the same time. The total amount due on the combined statement will be payable to NCDMV. As before, you can pay online, through the mail or in person at a license plate agency near you. The new system will be phased in with the vehicle registration renewals that are due in mid-2013. By mid-2014, all North Carolina vehicles will be incorporated into the system. What will be different about my annual renewal notice? The new renewal notice combines the information about your vehicle registration renewal fee and the vehicle property tax due. The new notice includes separate contact information for registration questions and for tax questions. The new Tag and Tax Together program allows you to make one convenient payment to NCDMV for both registration renewal and vehicle property tax. NCDMV will forward the property tax portion of your payment directly to your county revenue department. I pay my property tax with my mortgage. Does the new system include my home or mortgage property tax? How should I pay both fees? *If your mailing address has changed since your last registration renewal, the tax amount may need to be recalculated. If this is the case, do not mail your payment in. Contact your county tax office to see if your tax amount needs to be recalculated. Yes. Your vehicle’s annual registration renewal fees will remain the same. The increase in your bill is from the addition of the vehicle property tax. Do I still need to have my car inspected before I can renew my registration? Yes. Your vehicle must pass an annual safety and/or emissions inspection before the registration is renewed. As in previous years, you may have your vehicle inspected as early as 90 days before your registration renewal is due. How will I know how much property tax I owe? Information about your property tax will be included on the combined notice, along with your county and municipality tax rates and other applicable taxes due. No. You cannot renew your motor vehicle’s registration unless the total taxes and registration fees on the vehicle are paid at the same time. Are the vehicle property taxes for the coming year or the preceding year? Taxes due on the combined notice are for the coming year, covering the same period as the vehicle registration. Will I receive a notice if I have moved since my previous vehicle registration renewal? 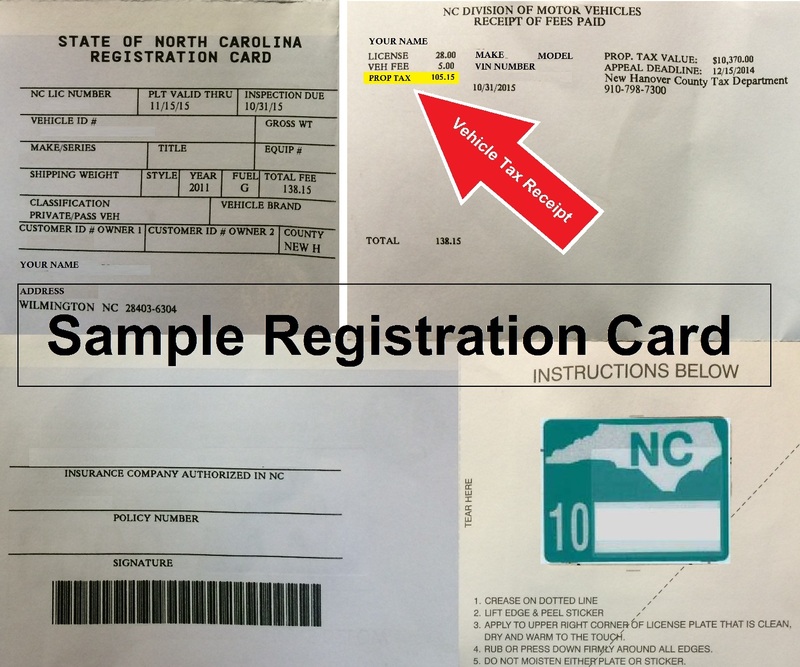 If you reported your new address to NCDMV, you should receive your tag and tax notice at your new address. If you did not notify NCDMV of your new address, you may not receive the renewal notice. If you have moved since your last renewal, your vehicle property tax may need to be recalculated. DO NOT SEND YOUR RENEWAL AND PAYMENT BY MAIL. You can change your address by visiting your local license plate agency or online by requesting a duplicate registration card for $15.00. What will happen if I don’t pay the registration and vehicle tax by the due date? Interest will be charged on late vehicle property tax payments and registration renewals. Your vehicle will also be subject to citation if it is driven after the tags expire. Once your vehicle becomes part of the Tag and Tax Together program and you have received the combined notice, you will no longer be able to pay your vehicle tax at your county tax office. Who should I contact if I have questions about my vehicle property tax? Contact information for your county’s tax office is on your Tag and Tax renewal notice, or refer to this list of county tax offices. How is the property tax determined on my vehicle? The county vehicle appraiser will value your vehicle based on its fair market value. Your property tax will be based on the tax rates and jurisdiction your vehicle is located in. After a vehicle owner has received their combined notice and the owner disagrees with the value, property tax, or vehicle tax location, they should contact the county tax office in which the vehicle resides. The owner has 30 days to appeal from the due date which is the 15th day of the month following the registration renewal action or similarly on a new registration. Tax receipts will no longer be available for reprint from the County offices. Your tax receipt can now be found on your registration card. Please see this example. Also, if you have your invitation to renew from NCDMV, you can also find your property tax amount there as well. Please see this example. New Hanover County used TEC Data pricing guide for current vehicle values. Any vehicle 25 years or older is priced from the Collector Car Guide. NCDMV’s website provides a tax estimator for vehicles. To get a vehicle tax estimation click here. Unlicensed vehicles such as cars, trucks, motor homes, trailers, motor cycles, and similar property are to be listed as Personal Property. Email taxadmin@nhcgov.com for real property and personal property address changes only. All motor vehicle address changes must be made at your local license plate agency! General Statue 105-330.2 (b1) Valuation Appeal-The owner of a classified motor vehicle may appeal the appraised value of the vehicle by filing a request for appeal with the assessor within 30 days of the date taxes are due on the vehicle under G.S. 105-330.4. An owner who appeals the appraised value of a classified motor vehicle must pay the tax on the vehicle when due, subject to a full or partial refund if the appeal is decided in the owner’s favor. The combined tax and registration notice or tax receipt for a classified motor vehicle must explain the right to appeal the appraised value of the vehicle. A lessee of a vehicle that is required by the terms of the lease to pay the tax on the vehicle is considered the owner of the vehicle for purposes of filing an appeal under this subsection. Appeals filed under this section shall proceed in the manner provided in G.S. 105-312(d). If a vehicle is in substandard condition or has high mileage a taxpayer may come to the New Hanover County Tax Department located at 230 Government Center Drive, Suite 190, Wilmington, NC with their vehicle for an on-site. An on-site allows the listing department appraisers to visually see the vehicle for condition and high mileage. A taxpayer must be within their appeal time. If a vehicle is not running a taxpayer may contact the New Hanover County Tax Department to schedule a time for a Listing Department appraiser to view the motor vehicle at their property. Taxpayers may email pictures (with the VIN # included) of the vehicle as well as a current inspection, oil change, or repair receipt that includes mileage. This refers to any rental vehicle that is offered at retail for short-term lease or rental and is owned or leased by an entity engaged in the business of leasing or renting vehicles to the general public. Please call (910) 798-7113 for more information.